Oliver is very excited to meet Soran and test his various magical jams. StoryToys is one of our favorite developers. Well-known for their 3D popup storybooks, they have been experimenting with new kinds of apps for kids. For example, ShipAntics and Dino Dog are their latest experiments that bring fresh approach to the world of apps for kids. The first is an excellent puzzle adventure game for early readers ages 6+, whereas the latter is an interactive adventure game combined with cartoon animation for kids ages 3+ to learn more about dinosaurs. Today, I want to highlight their brand new app called Jelly Jumble! It’s an objects matching game designed to be kid-friendly, and an integral part of a lovely story of Oliver and Soran. Oliver is a curious boy who loves to ask just about anything. Over the holidays, he is sent to live with his aunt Pru, who believes she has the cure for children’s curiosity. Clearly, Oliver is not happy to be staying with his aunt. During his stay, Oliver’s aunt asks him to do many chores. One of them is to pick rainbow berries from the garden. The activity is made to be an object matching game. You clear objects by connecting three or more objects of the same kind along a single continuous path, either vertically, horizontally, or diagonally. Each level has a different goal. You may be asked, for example, to clear a number of particular objects, specific locations on the board, or bring particular kinds of objects to the bottom of the board. The game limits the number of moves you can perform, so it’s usually a good idea to connect as many objects as possible in a single continuous path. Every time you complete three levels, a new chapter of the story is introduced. For example, you will soon learn that someone steals Oliver’s full basket. When Oliver traces the suspicious footprints into the forest, he meets Soran, a big, blue, cuddly monster who is responsible for the crime. Soran likes to make magical jams and jelly, and help the forest animals with their problems. The problems vary from fixing an orange squirrel’s tail to helping a hedgehog regain his shadow. With the new chapters, new game rules are also introduced. For example, to clear a big leaf, you may need to clear items adjacent to it because you can’t clear the leaves by matching them directly. You will also see how squirrels and giggle berries of different colors can be combined to blow up adjacent items, or to clear the board from the problematic leaves. Jelly Jumble includes 39 game levels in total. Two bonus levels are also available at the end of each chapter. If you manage to clear them, you will earn a sticker. All the bonus levels are timed (you typically get 30 seconds), so the challenge here is to complete the objectives before the time runs out. Jelly Jumble is a full game, which means you don’t need to unlock additional content, levels, power-ups, or energy via IAP to play. This fits nicely with the younger audience. I believe kids ages 4+ can already play the game independently. 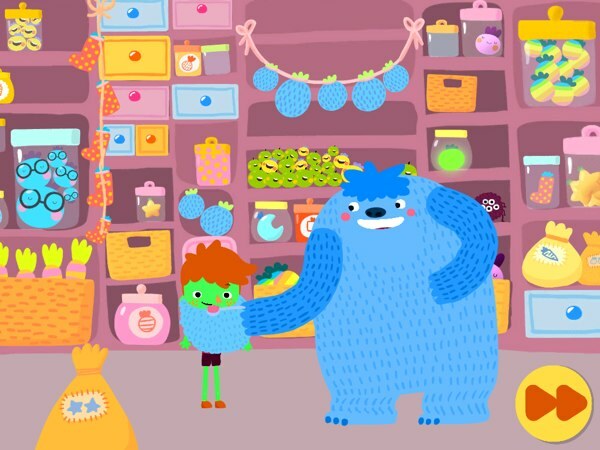 Jelly Jumble is beautifully designed by illustrator Evgenia Golubeva, and is written and narrated by BAFTA winning writer Myles McLeod. Jelly Jumble uses the familiar match-three game mechanic and many of its variants. I really like how the video clips are integrated at the start of each chapter. It helps create a cohesive storyline, with you helping Oliver and Soran complete their goals instead of simply playing the games without a purpose. It also helps that the levels following each video clip fit the theme of the story arc. The difficulty levels are also well-designed. New rules/mechanics are introduced one at a time, giving players enough chance to understand the new mechanic by completing the chapter levels. The decision to not have a time limit also makes it easy for new players to pick up the game. At the same time, more experienced players can play the bonus levels for more challenge. There are 39 levels and 24 bonus levels that you can play in Jelly Jumble! Jelly Jumble! is a fun objects matching game that’s safe and friendly for kids ages 4+ to play on their own. The gameplay is beautifully mixed with a lovely adventure story of a curious boy named Oliver and a friendly blue monster named Soran. And, you know it’s not going to create a big financial mess since it doesn’t include any IAP.